If you are following the series of post, in this post, I would talk about working with ResourceManager. ResourceManager class is nothing new, It been there since the inception of .NET framework. It was the de facto mechanism for working with localize resource file before aspnet core introduce IStringLocalizer. In this post, I want to demonstrate, ResourceManager still works in dotnet core, if you don’t want to go with fuzzy IStringLocalizer. Here, it creating new instance of the ResourceManager which take basename and assembly where these resource files are embedded. If culture specific resource is not found, say “de-de“, it will use default resource with any suffix for getting the value of the “key“. If “key” values isn’t found in the resource file, it will return value as “key” itself. If you need to get resource value for any other culture than the current culture on the running tread, you can by specifying the culture in the GetString method. Now, level 2. I had requirement where code for reading resource was in another assembly/dll then the one where resource files are located. It creates new ResourceName, pass the basename and assembly which contains the embedded resource. Since, it seperate dll, it get’s the calling assembly by Assembly.GetCallingAssembly() which would return api1.dll or api2.dll, whichever calls Lib1.Rdr.dll. Note, here if you had use Assembly.GetExecutingAssembly(), you will get Lib1.Rdr.dll. Rest would be taken care by the ResourceManager, it would read remote assembly embedded resources and it’s satellite assemblies to get the translated value. That’s all for Globalization and localization in ASP.NET Core. Hope you find this series of post informative. This entry was posted in dotnet core and tagged .NET, C#, dotnet core, globalization, localization on September 12, 2017 by sbrakl. In this post, I would be hinting on the ASP.NET Core way of Localization / Globalization. There is already a good post on this from the Microsoft official Docs for ASP.NET Core at https://docs.microsoft.com/en-us/aspnet/core/fundamentals/localization and I am not going to repeat what’s in that post but would be sharing few highlight’s of that article. // State what the default culture for your application is. // You must explicitly state which cultures your application supports. // i.e. we have localized resources for. This code (UseRequestLocalization) would set current culture info and current ui culture on the request execution thread. By default, It determines culture from QueryString, Cookie and Request Header. Read first post to get some insight. In order to understand better, I have create a sample application and have put the it on the GitHub, https://github.com/sbrakl/aspnetcoreglobalization where you can get the execution in action. If you debug this application, if your startup.cs initialization code is correct, it would see the set the thread culture. In the same method, it set the localize string from IStringLocalizer _localizer. Placement and name of this resources file are important, otherwise, it won’t be able to read it. Great extent of naming and placement is written at https://docs.microsoft.com/en-us/aspnet/core/fundamentals/localization#resource-file-naming. That’s all you need to work with IStringLocalizer. 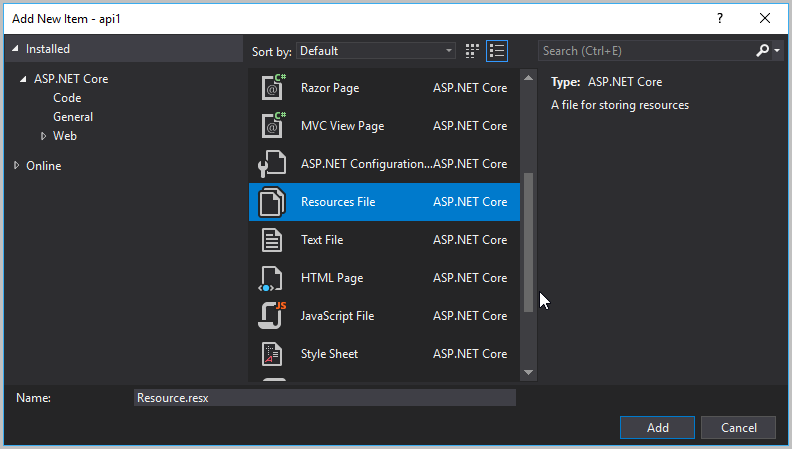 Dotnet Core is opensource, and you can read it code. When Dependency Inject (DI) is called to inject IStringLocalizer, it calls the ResourceManagerStringLocalizerFactory, which in turn create an instance of ResourceManagerStringLocalizer. Here, “Hello” is the key and whatever value in the resource file, it will get that. Resource + culture file to be specific. That’s the flow, how IStringLocalizer translated the messages. IStringLocalizer takes the type. i.e. HelloController is the type. You resource needs to have HelloController name without default language resource file. What does in mean? 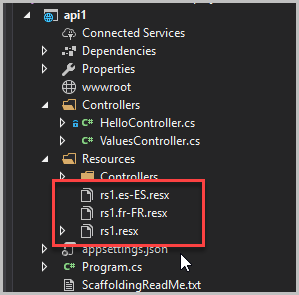 “abc.resx” is default, if for any other cultures is pass apart from “FR-fr”, “ES-es”, this file would be used. In the startup.cs code, you mention resource path, where to find all the resources. It doesn’t need to “Resources”, it could be anything. When assembly is build, resource file would go as emended resources into the dll. ASP.NET Core would build satellite assemblies for different culture which you have mention. By definition, satellite assemblies do not contain code, except for that which is auto generated. Therefore, they cannot be executed as they are not in the main assembly. However, note that satellite assemblies are associated with a main assembly that usually contains default neutral resources (for example, en-US). A big benefit is that you can add support for a new culture or replace/update satellite assemblies without recompiling or replacing the application’s main assembly. ResourceManager would find the resources embedded in assembly / satellite assembly base on the resource path and type name. It all good, when you are going translation in the same assembly, where resource files are located. But, in my case, resource file where in one assembly, and code to read from resource file was in another assembly. This where ASP.NET Core IStringLocalizer faded and was limited to for me. I need to resorted to good old ResourceManager which I would describe in the other post. Here, this post is about my experience in the globalization and localization in asp.net core application. Say, you need an web application which caters to different language say English and French. Greeting like “Hello Friend” needs to be translated to “salut l’ami” in french. How do we do it, simple. Create file with Name Value, on for English and other for French. Base on the language, it will pick from the respective file. This is the idea of Globalization and localization. Dotnet folks figure this out long before in .NET 1.1 framework and in same can be done with Resource files in .NET. 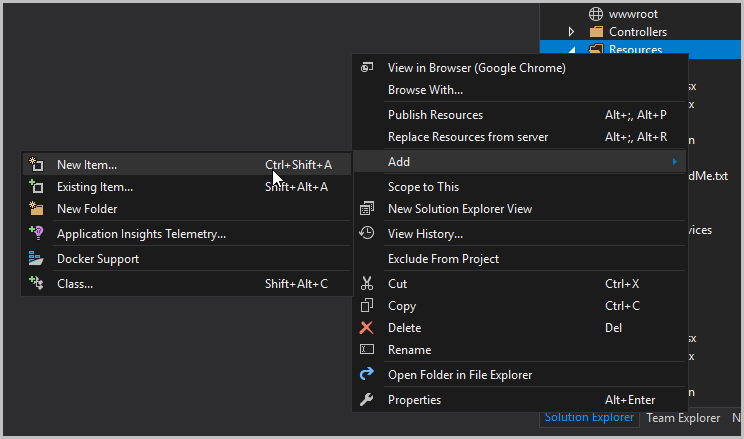 In Visual Studio, you can add resource file to your project. Similarly, you can add different culture resource file. Culture are denote by two letter alphabets like en, or en-US, en-UK. That’s US English and UK English. es-ES is Spanish Spain and es-MX Spanish Mexico. If just es is mention, then it defaults to Spanish Spain, en defaults to en-US. Culture is the .NET representation of the default user locale of the system. This controls default number and date formatting and the like. UICulture refers to the default user interface language, a setting introduced in Windows 2000. This is primarily regarding the UI localization/translation part of your app. Now, In ASP.NET, say your server in running in UK and you got the request from France. How does ASP.NET application know, it have to serve french text? Next post we will see, how to implement asp.net localization package and how to use it. This entry was posted in dotNET, dotnet core and tagged .NET, C#, globalization, localization on September 8, 2017 by sbrakl.